The Schick Dental S1-Ceramic Milling Set is an upgrade that comes complete with everything you need to upgrade your S1 Basic to a full duty ceramic milling machine. 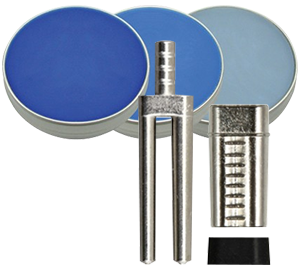 Schick Dental sets new standards in the field of milling high performance ceramics and Titanium with their newly developed ceramic milling sets. A newly developed suction tub used in connection with a lighted turbine makes the work of milling pressable ceramics or zirconium possible. When working with Titanium the suction tub is used with the traditional motor powered milling spindle. In both cases due to the increased health danger special care was taken for the total removal of the arising mill dust and cooling water with the use of a special separator unit. For the rework of primary parts or implant abutments made of zircon ceramic, alumina or pressable ceramic. With this new accessory for the S1 Basic milling machine no additional milling equipment is needed. A turbine with a speed of 300,000 rpm is used and is inserted into the milling equipment in place of the motor milling spindle. Additionally the turbine is equipped with the proven light technology of Schick Dental. For the avoidance of temperature dependant micro cracks in the ceramic, the system is fitted with water cooling. When working with titanium the suction tub is used with the traditional motor powered milling spindle. When working with the turbine it is important to evacuate the water mist and milling dust due to the increased health hazard and the possibility of impairment of visibility by the water mist that is produced. In addition when working with the motor powered milling spindle to treat Titanium it is extremely important to remove the light grit that is created. With these concerns in mind Schick designed an extraction system that combats these hazards. A special tub was designed that fits on top of the standard working table and it contains the dust, water and particles with its special design, including the suction capabilities when connected to an extraction unit. The tub was designed to allow optimal extraction capabilities while still giving the user comfort and control while working. Schick then designed a special separator unit that is used in conjunction with any dust extractor. When working with the turbine the resulting grit and cooling water are transported through the suction tub, into the separator and then into the dust extractor. To stop any water from entering the dust extractor a special check valve was included in the design of the separator. This system also stops the water from coming into contact with the milling equipment and creating a messy work environment. The system can be operated by connecting the separator with all commercial or central suction systems. To complete the system 1 set each of diamond tools and 1 set of special polishers for ceramic are included for the optimal treatment of ceramic primary parts and implant abutments. Please note that the S1-Ceramic Milling Set is an upgrade package and it does not include the S1 Basic Milling Unit. If you are interested in milling ceramics and do not have an existing milling unit please contact us to find out what setup is the best to suit your needs.